This is perfect for storing my small kitchen appliances. It is very stable, strong and very well built. It fits perfect in the corner of my storage room by my kitchen. Honey-Can-Do SHF-04886 5-Tier Corner Shelf Unit, Chrome. Create visible, accessible storage space instantly with Honey-Can-Do industrial shelving systems. Contemporary chrome finish and 72" steel frame make this unit the perfect blend of style and functionality. Durable enough for the mudroom, garage, or commercial kitchen; this unit is capable of withstanding up to 350lbs per shelf and its unique design makes it perfect for a corner. Adjustable shelves allow you to change the configuration as your storage needs evolve. Clear shelf liners included. I bought this to use in my kitchen pantry, but it was a bit larger than anticipated. So I use it in our spare room, which we use for storage since we live in Florida and don't have a basement. All my seasonal items are organized and easy to reach. I love that the shelves are adjustable, so I can fit large heavy items on the bottom without having to lay them down sideways. This shelf fit perfectly next to our garage refrigerator. Its shape gives us easy access, too. It is sturdy and goes together easily. Nice shelf with perfect function. We purchased this item for added storage in our garage. This item is able to hold so much and allow my family some added space around our house. It also fits perfectly into any corner. Great quality, great price, amazing purchase. 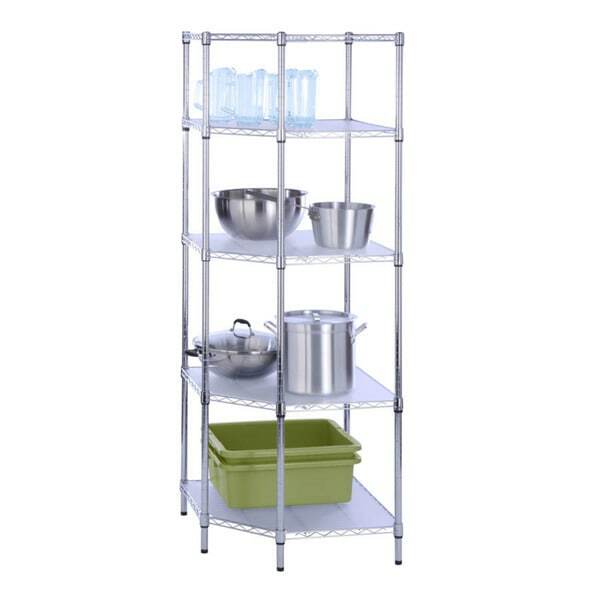 I just ordered ANOTHER one of these, plus two more of the same brand in regular shaped shelves to go in between them. These turned out to be exactly what I was hoping for. I'm going to have the storage I need in the garage, and still have enough room to fully open both car's doors. Gotta love it! Great shelf. Super strong. Great design. Hard to assemble alone in the beginning. Easy to assemble. Strong construction! Well built, easy to put together. "There are 5 sides (and height) but only 2 measurements are listed for length and width. What are the dimensions for all of the sides?" This item measures 27 in L x 18 in W x 72 in H.